We’ve all heard the doomsday statistics that have been popular over the last several years, proclaiming that human attention spans have shrunk to become smaller than a goldfish’s, and that marketers might as well just give up on creating any promotional content longer than two seconds. 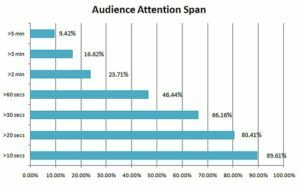 A particularly sobering study indicates that, while 89% of the audience are engaged in ads shorter than 10 seconds, only 46% of people are still engaged by the 60-second mark. #1: Don’t be afraid to create longer content, as long as it’s high-quality. 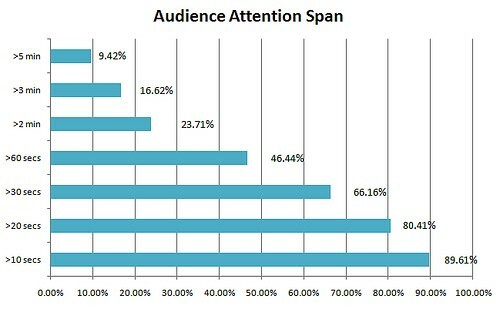 These attention span statistics do NOT necessarily mean that every single ad you create needs to be under ten seconds long. In fact, the most watched ad on Youtube in 2017 was four minutes long–plus, not a single one of the top ten most watched ads of 2017 were under thirty seconds. Clearly, consumers are mentally and physically capable of watching longer ads–as long as they do a good job of keeping viewers’ attention through narrative storytelling and engaging visuals. Prezi’s 2018 State of Attention report emphasizes that our attention spans are not so much shortening as they are evolving. #2: Emphasize narratives and visuals that are unique and engaging. If you take a look at the top ten most watched ads of 2017, you’ll find huge variations in terms of length, product, and target audience. The one thing they all have in common? They all tell a story, and they tell it in an engaging way–through celebrity cameos (hello Melissa McCarthy and Natalie Portman), striking imagery, and emotional knockouts. Consumers are telling companies exactly what they want–we just have to listen. 85% of survey respondents said a strong narrative is key to maintaining audience engagement, and 73% cited the use of animated visuals as a critical component of an attention-getting ad. And 31% of millennials (the holy grail of target audiences for marketers) say they will only engage with content that they feel has a great story or theme. #3: Still worried? Try a snack ad. Of course, many marketers are combating the decrease in consumer attention spans by packing great storytelling and visuals into a more compact ad. These are “snack ads,” videos less than ten seconds long which have become increasingly prevalent on Youtube and (recently) Fox streaming services (here are a couple of good examples). As with most marketing content, the goal of a snack ad is to be immediately striking and acquaint the viewers with the product in a quick and memorable way. You don’t need to tell your consumer everything about your product in the ad–you just need to get them curious enough about your product to remember it and look it up later. The key takeaway from all this? There is no hard-and-fast rule about how long your promotional video content should be. But the best way to market to consumers with shorter attention spans is actually the same method you should use to market to anyone: create high-quality, easily-digestible content that will make a lasting positive impression on your consumers’ minds. For more information about how the team at ZAG FIRST can help you create compelling content, please contact us.